The 2019 SXSW Interactive Festival is only a few days away! From March 8-12, Austin will be transformed by industry parties, pitch competitions, awards, and abundant networking opportunities concurrent to the SXSW Conference. Thankfully, we’ve created a go-to guide for navigating the festival, finding sessions you’ll love, and walking away from the event inspired by the future of emerging technology. Make sure you save yourself a spot! RSVP for Mentor Sessions, Round Tables, and Workshops to gain one-on-one coaching and guidance from industry experts while at SXSW. During the event, lines can be tricky to navigate! Learn more about access and line procedures and our event navigation tools. This year we’ve made it easy for you to check the current status of a venue’s remaining capacity. A Green-Yellow-Red system appears on SXSW GO, on the sxsw schedule, and on the large digital Event Status Boards around venues. Admission is subject to capacity. If there’s a session or event you are particularly excited about, request a SXXpress Pass. Jump to the head of the line with a SXXpress Pass! New for 2019, registrants with Platinum, Interactive, Film, and Music Badges are able to request priority access to individual Conference sessions and parties, Music Festival Showcases, Film Festival Screenings, and Comedy Festival Showcases. If you’re planning on catching a screening, please note that The Paramount Theatre and Stateside Theatre have a new bag size limit! Before you get in line for screenings at these historic landmarks make sure your bag will be allowed inside! If you haven’t started building your schedule yet, what are you waiting for? Start your SXSW experience with the Interactive Opening Party Presented by MOON Selfie or the International Women’s Day Celebration. Don’t miss out on other quintessential SXSW Interactive Festival events such as the Interactive Mix at Six and the Interactive Bash. 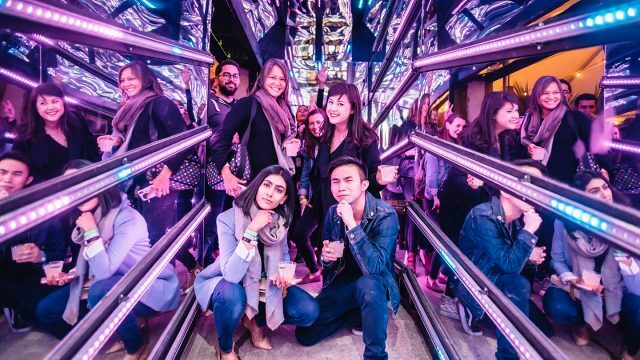 Explore the full list of all Lounges & Parties happening at SXSW 2019! The SXSW Interactive Festival is known for its pitch competitions such as SXSW Pitch, SXSW Release It, Place by Design, and the SXSW Interactive Innovation Awards. For years, these competitions have supported new ideas, driven early-stage deals, and brought together entrepreneurs and investors from all over the world. Enjoy the celebrations, learn about cutting edge technology, and network with the innovators behind it all. Find Conference sessions you’ll love and use our sessions format guide to help you navigate the schedule. To find sessions most relevant to you, browse through our 2019 Programming Trends. Each year, the SXSW Programming Team curates a list of significant trends from Conference programming that provides insight into the future of tech, entertainment, and culture. Find trends that interest you and add their sessions to your schedule! If you still haven’t purchased your badge for SXSW 2019, there’s still time to join us! Register to attend and book your hotel to begin your SX adventure and help us write the next chapter of SXSW from March 8-17.